Banner Saga 3 Release Date Announced | Nerd Much? Stoic has announced that the conclusion to their epic Banner Saga series is nearly upon us. Banner Saga 3 is releasing in July. There will be three different SKUs in which to purchase Banner Saga 3 on PC. The game alone will run on Steam for $24.99. For $29.99 you can upgrade to the Deluxe Edition package which throws in the game’s official soundtrack, a digital wallpaper, a world map and the “Gold Wasp” in-game title. Finally, for $39.99, you can go all-in on the Legendary Edition of Banner Saga 3. You’ll get everything in the Deluxe Edition, as well as the “Shadow Walker” Heroic Title, the Petrie Clan Ring legendary item, and the digital novel entitled Gift of Hadrborg. Stoic are also offering a pre-order bonus for those that purchase early on Steam. They ‘re calling it the Drudge Ally Pack. And it certainly sounds like the contents are designed to make the game considerably easier. Stoic themselves state that the Drudge Ally Pack will “help you complete your final journey.” Within it comes a rank 10 hero named Kivi. Kivi has a few unique qualities in Tank for combat and Sculptor’s Tools as its Dredge Item. He brings with him Dredge Heraldry and the Heroic Title “Shield Clever”. Those that opt-in for the pre-order bonus will also earn themselves an exclusive Banner Saga 3 overture track composed by Grammy-nominated and two-time BAFTA winning composer, Austin Wintory. 505 Games is also publishing what they’re calling The Banner Saga Trilogy: Bonus Edition. The package costs $39.99 and will be available at major retailers for Xbox One and PlayStation 4. It includes Banner Saga, Banner Saga 2, and Banner Saga 3. It also packs in a mini art book, a poster, a best of soundtrack and an unspecified in-game digital item. 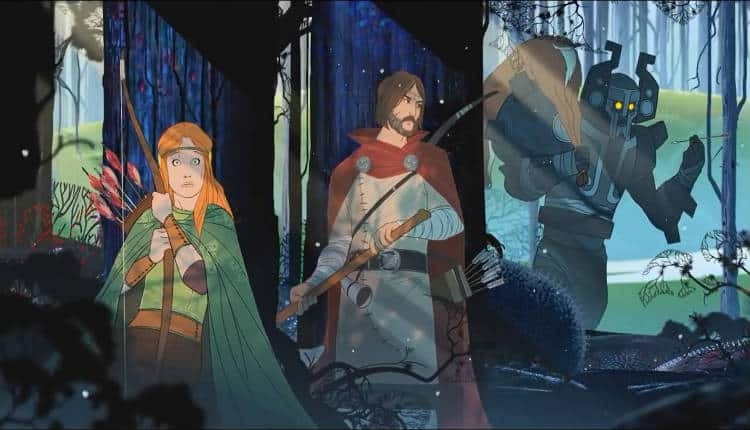 The Banner Saga Trilogy will hit shelves on the same date that Banner Saga 3 launches – July 24th. The finale will be available for PC, Mac, PlayStation 4, Xbox One and Nintendo Switch. Mobile platforms will get the game at a later date.